Digital cameras and online galleries have transformed how we take, organize, and share pictures. But part of me misses the simple, organic fun of casually sifting through a pile of photos. Conceived and co-programmed in Hawaii, Flickpad offers a unique and instantly intuitive way to explore the photos your friends post on Facebook and Flickr on your iPad. 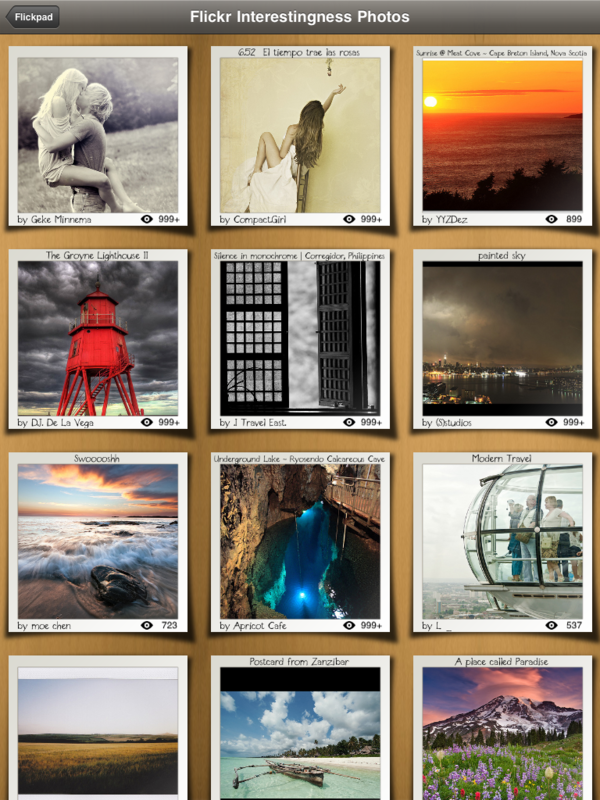 While both Flickr and Facebook obviously have web interfaces, Flickpad takes a more human approach to browsing images. Which is to say, a slightly random one. I was eager to learn more. If you are, as well, read on for details on how you could win a free copy of Flickpad. Podoski moved to Hawaii six years ago, after working for Nike at its headquarters in Beverton, Ore. Most recently, he worked for Blue Lava Technologies, developing the company’s now defunct photo sharing application, ILovePhotos. The intersection of technology and photography was a natural focus for him, as he’s been an avid digital photographer for over a decade. His photo library is overflowing with over 35,000 images. Thanks to the web and social networks, he’s immensely enjoyed sharing his pictures, looking at pictures posted by his friends, and giving and receiving feedback. But the user experience on both services was missing something. So Podoski set about to shake things up with Flickpad. Once linked to your Facebook and Flickr accounts, users fire up the app and see a haphazard cluster of pictures, overlapping and askew. At first, even I wasn’t sure how the mess was an improvement. Sure enough, upon launching Flickpad, your eyes are immediately drawn to a select few images — even images that might be partially covered by another. In fact, sometimes only the corner of a photo can be enough to spark your curiosity. A splash of color, the edge of a cloud, a patch of bare skin. The eye likes what the eye likes, and the randomness adds the perfect touch of fun, little moments of discovery that you wouldn’t get from a boring matrix or list of photos. And since Flickpad is an iPad app, navigating through photos and calling up new images is as simple as moving them around or “flicking” them away with your fingers. “The choice to heavily use multi-touch gestures ties back into the theme of making the app engaging and fun, as well as allowing the user to quickly process an ever growing number of photos from their online friends,” Podoski says. I did find at least one “grid view” in Flickpad. You get it when you browse the “Interestingness” gallery on Flickr, which displays the most popular images across the entire photo sharing network. Though they’re not photos from your friends, they’re almost always worth a lingering look. Getting started with Flickpad comes naturally. But the app has a number of other features. Flickpad supports commenting on both Flickr and Facebook, lets you mark favorite photos, and email or save photos to your iPad. You can browse photos from specific friends, block photos from specific people, and if you get tired of “flicking,” you can activate a slideshow feature and set your iPad up as a digital picture frame. Flickpad also has “fast user switching” so it can be enjoyed by multiple users of a single iPad — a feature I wish all iPad developers would provide. Podoski is half of the Shacked Software team. His partner is Dustin Bachrach, a senior studying Computer Science at Rice University in San Antonio, Texas. Bachrach has released a number of open source applications, and is a three-time Apple Scholarship Award Winner. For Flickpad, both Podoski and Bachrach served as designers as well as programmers. And while Flickpad has done well — the recently introduced Flickpad Lite has climbed as high as #2 in the free photo app category in the App Store — it’s not all the pair work on. I enjoyed being one of the beta testers for Flickpad when it was only a Facebook photo app, and rejoiced when Version 2.0 added Flickr support. It was originally priced at $9.99, which is admittedly not as cheap as most photo apps. Right now, however, the price has been dropped to $6.99. Even better, you can try this innovative photo app for free with Flickpad Lite. The Lite version is limited to two user accounts, five active friends per service, and five searches per app launch, certainly enough to see how Flickpad works. But if you comment on this post by Saturday, Aug. 28, you could win one of two free copies of the full app, courtesy Shacked Software! Of course, you’ll need an iTunes account and an iPad to redeem. Looks to me like this app will be well worth checking out. 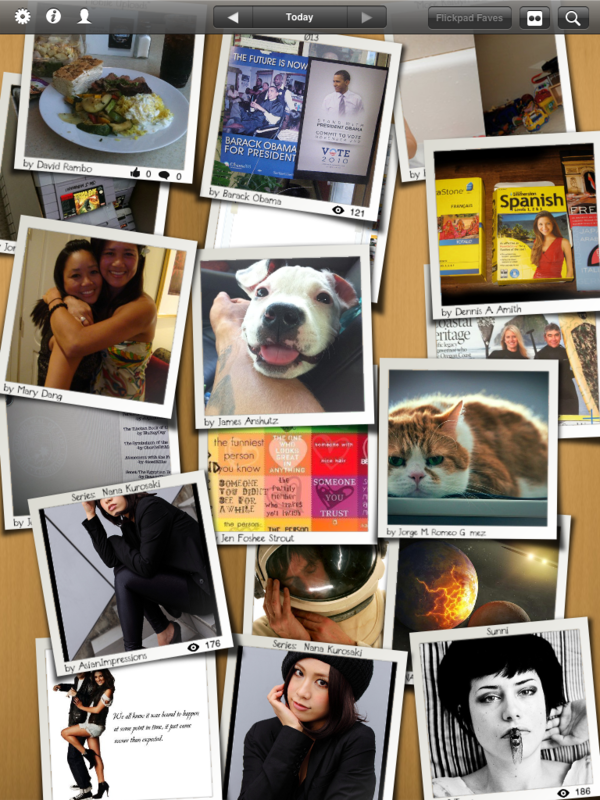 i’ve used the free one for a week, and it is indeed a good way to view facebook and flickr photos. no idea it was born in hawaii! nice. Wow, looks like a really fun app! Does winning last week preclude me from winning this week? he he he. Curious, do you know how the company came up with the name “Shacked Software”? Grrr. I really need to get an iPad! Ryan…glad I finally made it here and I’m hoping this entry counts. I’m rocking the Lite version per your awesome review and like the UI and the whole experience. Here’s hoping I win, or I might have to bust out my $7 to download the full app. Random.org spits out 3 and 2! That means our winners are iquanyin and jeannemarie! I’ll get in touch. Thanks, everyone, for commenting!